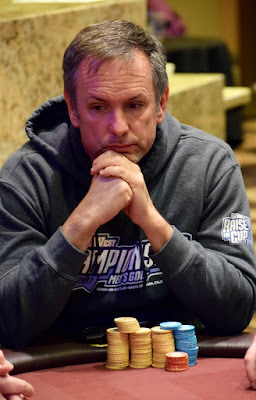 2015 Ante Up World Champ Cy Williams moves all in UTG, George Saca undershoves and Don Deeds moves in for about 15,000 more than Williams, the UC Davis Golf coach. Action folds around to Matt Boddorf in the BB who agonizes about whether to get a fourth stack in the middle, but instead he flashes Norman Chad's prettiest Card in the Deck and mucks. Deeds has two more Queens. The board runs out 6-5-5-3-5 and the boat for Williams is better than the boat of Deeds. Saca is eliminated in 25th place, Williams to 120,000 and Deeds to fewer than 5 BB.